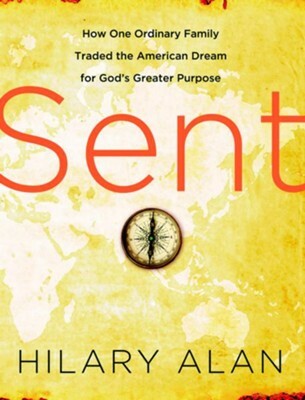 If anyone had the ability to succeed as a committed Christian as well as a high-achieving American, it was Hilary Alan. She and her husband, Curt, had a beautiful home, a fast-track career, and talented, successful children. But in the midst of their comfortable life and active church involvement, they realized they rarely heard from God. Sent tells the story of ordinary Christians who accepted two words from Jesus at face value and found that doing so changed everything. In Jesuss call to "follow me," the Alans discovered answers to the most pressing human needs: meaning, purpose, vocation, significance, and Gods plan for the future. For the Alans, it led to selling nearly all their belongings and moving with their children halfway around the world. For you, the particulars will be completely different, but no less significant. Jesuss call can change everything in your life. As you follow Hilary Alans journey in response to Jesuss call to discipleship, you will gain a clear understanding of the things that can keep you from obeying God. You will no longer wonder if youre investing your life in the best way possible, because two words from Jesus change everything. HILARY ALAN, a former public relations professional, is a wife and mother of two children. Hilary and her family moved to Southeast Asia in the aftermath of a tsunami that destroyed villages, homes, businesses, and hundreds of thousands of lives. Today, the Alans continue to advance the work of Christ internationally in their involvement with a church in North Carolina as they prepare for another overseas assignment. "There are people who talk a lot about going on adventures with God, and then there are people who actually go. The Alans are part of the latter group. In the years Ive known them it has been an honor to watch their story unfold. Im thrilled that now you will get the chance to hear their story as well!" them in a youth group with kids who are at least as clueless as your own. I wish every American parent could read Sent." "Sent chronicles one familys journey from the comforts of America to the challenges of going to the nations. You will be blessed and convicted by what you read. The Alan familys story can help change you for the glory of King Jesus!" "Having spent years leading the largest missionary-sending agency in the world, I never ceased to be amazed at the parade of young families that turned their backs on the comfort, security, and affluence of the American Dream to take the gospel to unreached nations. Sent is the inspiring testimony of one of those families. Be prepared to face the challenge of making the same radical choice." 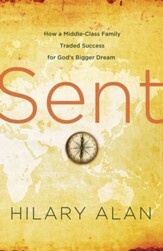 I'm the author/artist and I want to review Sent: How One Ordinary Family Traded the American Dream for God's Greater Purpose - eBook.